Mr Midnight and myself have both been planning out quests, while the rest of the team is working hard on artwork. We started on Market Street as we continue to seek and destroy the unusual bug with the gremlin monsters. Quests will be set-up for both good and evil players. 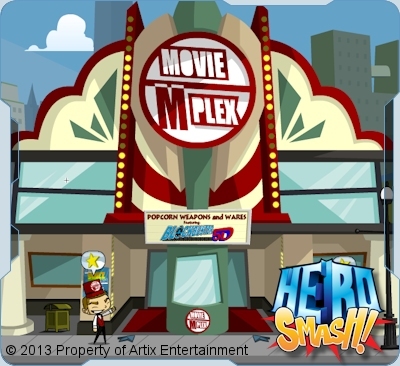 Movie Plex is getting a facelift and a new secret 'boss' room. We've also started adding street signs (needs adjusting as we are trying to create a better city map). Like all of you I am super excited about having a quest writer. The HeroSmash team is shaping up and we are super focused on making the game better for everyone! While the are no new items and quests this week, we will be rolling out the updated Market Street map. Next week we plan to roll out new quests and start adding cosplay gear inspired by movies selected by you, the players.